Our state of the art studio and design team are able to supply you with amazing images that will bring your ideas to life on a shirt by working alongside you or with initial guidance and then create the colour separations ready for printing. 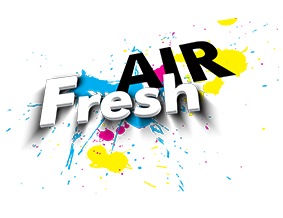 In the Fresh Air art studio we have a team of three artists / separators with over 40 years combined experience of creating and separating images for all mannner of customers from rock bands to company logos to childrens wear. Each artist has their own individual style and is able, if necessary , to create from the customers drawings or from just sitting down with the customer and discussing ideas. We will come up with various ideas which will be emailed for approval and then separated for sampling / production. We can produce photo-realistic images, cartoon style designs or logos and type whatever suits the customers requirements. Fresh Air offer a design service at a very reasonable rate. We will send artwork to you via email for approval before we proceed with an order, and if you require changes we will be happy to accommodate this. If you are using non-standard fonts within your artwork, please provide vectorized outlines of the text you require. We do have a set range of custom fonts available, which you may also choose from. Artwork can be supplied on DVD, CD, or via email. Artwork can also be provided on paper and, again, this is preferred to be as near to actual size as possible. We try to return the artwork you provide with your order, but there is a risk of damage or loss. We cannot guarantee return, so please make copies. If you are unsure about how to supply artwork, please feel free to get in touch with us.